EPI’s Daniel Costa delivered the following testimony before the U.S. Senate Subcommittee on Immigration and the National Interest on Wednesday, June 8, 2016, at 2:30 p.m. Thank you to Chairman Sessions, Ranking Member Schumer, and other distinguished members of the Subcommittee for allowing me to testify at this hearing on the H-2B temporary foreign worker program. I work for the Economic Policy Institute, a think tank dedicated to advancing policies that ensure broadly shared prosperity. I am especially honored to be before the Subcommittee on Immigration because I am myself the son of two immigrants to this country, each of whom came from a different country, and who met each other in the great melting pot that is my home state of California. I and my parents are the direct beneficiaries of the American immigration system—and the three of us can never repay the debt that we owe to the United States, nor can we overstate the gratitude we feel for the opportunities it has presented to us all. But beyond how immigration benefits the individuals who immigrate, the United States has also benefitted greatly from immigration—both economically and culturally—and there is no question in my mind that immigration is good for the United States. All labor migration to the United States should be managed in a way that adds value to the labor market—by adding needed skills and education, and to fill labor shortages. The H-2B program fails on all counts. It also fails both American workers and migrant workers. American workers should have certain rights vis-à-vis the U.S. temporary foreign worker programs. First, they should have the right to have a fair and first shot at job openings in the United States. For skilled occupations, they should be preferred for job openings when they are equally or better qualified; for unskilled or lesser-skilled job openings, they should be preferred if they are minimally qualified. Second, U.S. workers should have the right to be protected from competition with workers who are paid artificially low wages that are the result of corporate exploitation of the immigration system. In H-2B—and in fact in most other U.S. temporary foreign worker programs like the H-1B—this is far from how program rules operate in practice. Migrant workers who are recruited to the United States to fill job openings should also have certain rights. They should have the right to be free from paying fees to the recruiters who connect them to jobs in the United States. They should have the right to leave an abusive or law-breaking employer. And they should have the right to be paid no less than the local average wage for the job they fill, according to U.S. wage standards. The U.S. government and the H-2B program is also failing to provide these basic rights to the H-2B workers in the United States. My testimony will focus on how the H-2B program works and how it is used, the occupations that most H-2B workers are employed in, the wages and working conditions of H-2B workers and how that impacts American workers, and the impact of H-2B regulations on employer recruitment efforts to hire Americans, DOL enforcement, and H-2B wage rates. The H-2B visa program is a temporary foreign worker program—also known as a guestworker program—that authorizes the employment of foreign workers by a U.S. employer, for a temporary period, with nonimmigrant visas. Nonimmigrant visas are temporary—that is, the visa-holder must depart the United States by a date certain. And it is important to distinguish them from “green cards,” in other words, immigrant visas that grant permanent residence (and eventually citizenship, at the option of the beneficiary, if certain steps are completed). That fact is important, because as with most other guestworker programs, the employer of the H-2B worker owns and controls the visa. In practice that means that if an H-2B worker is fired, he or she becomes instantly deportable. Landscapers/groundskeepers account for about 40 percent of all H-2B jobs. The second-largest occupation is forestry workers, at about 8 percent.2 In fiscal 2014, the top two occupations accounted for nearly half of all H-2B jobs.3 The other top occupations include amusement and recreation attendants (working at traveling carnivals), maids and housekeepers, meat and fish processors, construction laborers, and restaurant workers such as cooks and waitstaff. 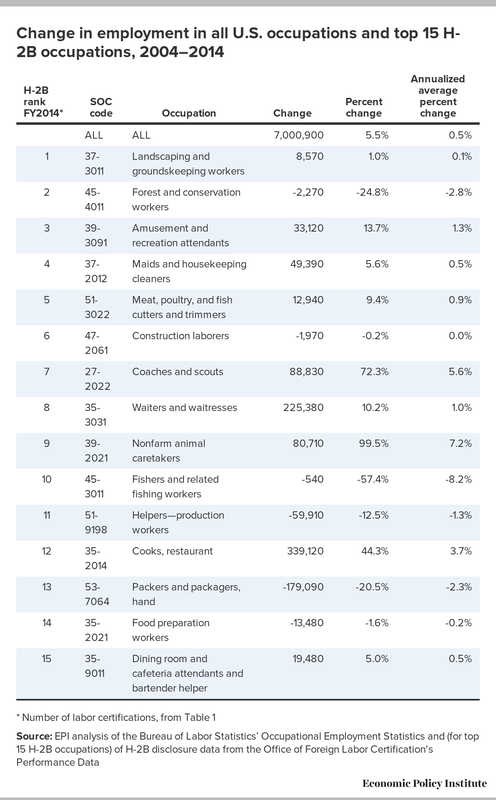 Table 1 shows the top 15 H-2B occupations in fiscal 2014. Note: SOC stands for Standard Occupational Classification system used by federal agencies to classify workers into occupational categories. Data set excludes records from original labeled "certification expired" and "partial certification expired" because expired records were not likely to become approved USCIS H-2B petitions or visas issued by the State Department. Congress has set an annual limit of 66,000 H-2B visas per year, but there are a few occupations that are explicitly exempt from this limit. In fiscal 2015, the State Department issued nearly 70,000 H-2B visas.4 However, the “returning worker exemption,” which has been in effect since December 2015, is likely to result in a much higher number of H-2B visas being issued in fiscal 2016 than the annual cap of 66,000 (for more about the returning worker exemption, see the next section). As a result of congressional appropriations riders, what’s known as the returning worker exemption was passed into law in late 2015. It increases the number of H-2B visas that may be issued in fiscal 2016. Under the returning worker exemption, any person who was employed as an H-2B worker during the past three fiscal years may return as an H-2B worker in fiscal 2016 without being counted against the annual cap of 66,000. The purpose of the H-2B program: For labor shortages or cheap, temporary labor? The H-2B program was created in order to allow U.S. employers to hire temporary foreign workers when American or otherwise authorized U.S. workers are unavailable. The language creating the H-2B statute makes this clear. H-2B workers must be “coming temporarily to the United States to perform other temporary service or labor if unemployed persons capable of performing such service or labor cannot be found in this country”8 [emphasis added]. The plain language of the H-2B statute clearly states that H-2B workers cannot be hired unless 1) unemployed persons 2) who are capable of performing the job in question 3) cannot be found in the United States. In other words, the program is intended to help employers who are experiencing a labor shortage—i.e., when employers cannot find workers to hire for lesser-skilled jobs. Groups like the Essential Worker Immigration Coalition—a lobbying group representing the interests of employers—claims that it is “concerned with the shortage of both semiskilled and unskilled (‘essential worker’) labor” and thus “supports policies that facilitate the employment of essential workers by U.S. companies that are unable to find American workers.”9 Representatives of other influential corporate lobbying groups, including the U.S. Chamber of Commerce and ImmigrationWorks USA, have made similar claims. As a result, these groups lobby Congress to expand the number of H-2B workers, and to create new similar temporary foreign worker programs to fill low-wage jobs. Despite such claims from industry groups—other than employer anecdotes—no credible data or labor market metrics have been presented by non-employer-affiliated groups or organizations—let alone by disinterested academics—proving the existence of labor shortages in H-2B occupations that could justify a large expansion of the H-2B program. A detailed explanation of how to conduct a labor shortage analysis is beyond the scope of this testimony. A substantial body of literature already exists on the subject, and in fact, this testimony will not conduct a detailed shortage analysis or make a determination about the existence of shortages in H-2B occupations. Exact methodologies for determining labor shortages may vary, and a discussion about their relative efficacy is also beyond the scope of this testimony. 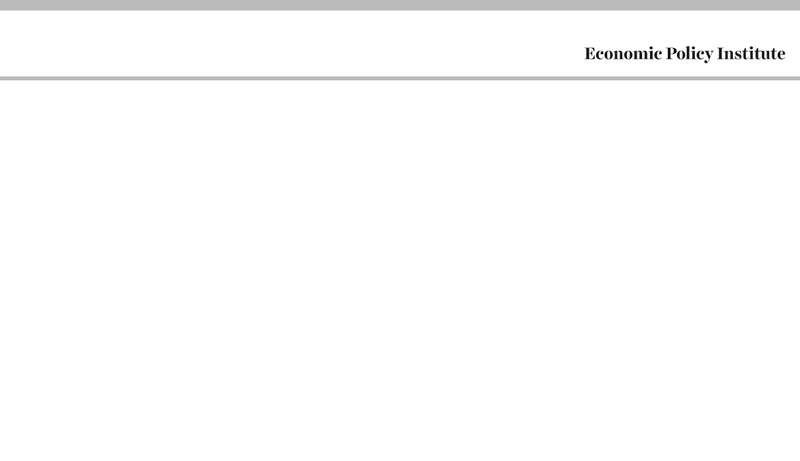 Nevertheless, there are basic definitions that many labor market economists can agree on. A good example of how to determine a labor shortage is the simple definition offered by economists Philip Martin from the University of California, Davis, and Martin Ruhs from Oxford University, who have summarized the three essential elements required to establish a shortage.10 Martin and Ruhs assert that industries and occupations reporting labor shortages should have (1) rising real wages relative to other occupations, (2) faster-than-average employment growth, and (3) relatively low and declining unemployment rates.11 The following sections will review the available evidence on wages, employment growth, and unemployment rates in the top 15 H-2B occupations. 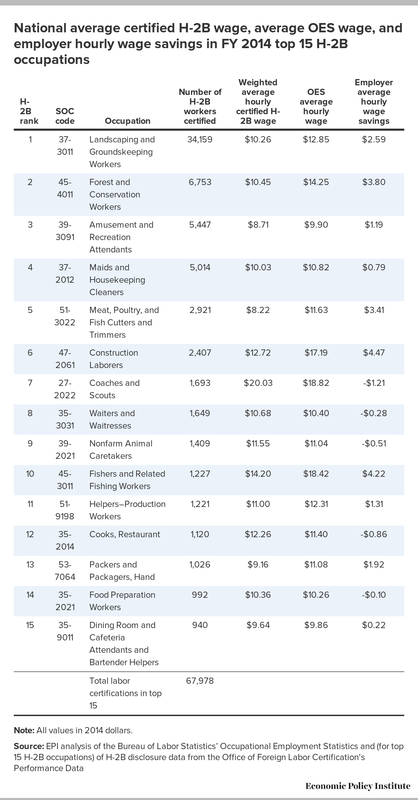 Table 2 shows the change in hourly wages for all workers in the United States and workers in the top 15 H-2B occupations from 2004 to 2014, adjusted to 2014 dollars. As the table shows, there was no significant wage growth for workers; wages were stagnant (growing less than 1 percent annually) or declined for workers in all of the top 15 H-2B occupations between 2004 and 2014. For all workers in the United States in all occupations, wages rose by just $0.40 in real terms (adjusted to 2014 dollars), just 1.8 percent over the decade. For workers in 10 of the top 15 H-2B occupations, wages declined, between $0.13 and $0.93 in 2014 dollars. The five occupations that saw slight hourly wage increases were Forest and Conservation Workers (by $0.04, or 0.3 percent), Maids and Housekeeping Cleaners ($0.02, 0.2 percent), Waiters and Waitresses ($0.80, 8.3 percent), Fishers and Related Fishing Workers ($0.82, 4.7 percent), and Dining Room and Cafeteria Attendants and Bartender Helpers, ($0.54, 5.8 percent). While workers in these occupations experienced real wage growth between 2004 and 2014, it was insignificant; wages in each of the five occupations grew by much less than 1 percent per year. Nationwide, workers in the other 10 top H-2B occupations were actually worse off in 2014 than they were 10 years earlier. 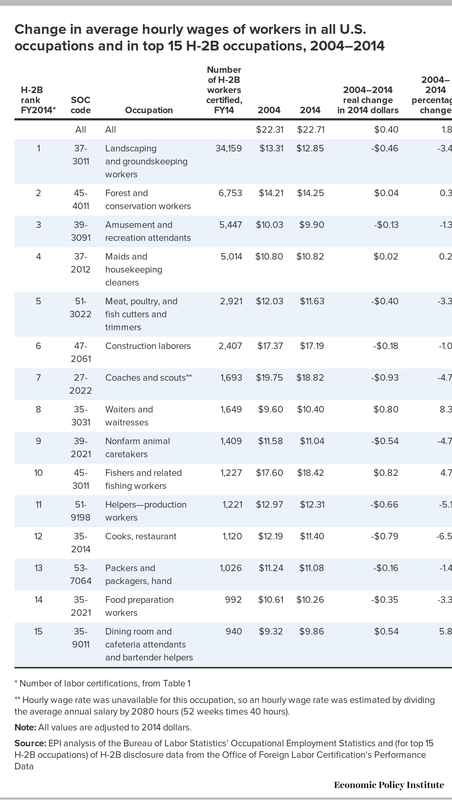 Table 3 shows the change in employment from 2004 to 2014 for all occupations in the United States, and for all workers in the United States who were employed in the occupations making up the top 15 H-2B occupations in FY 2014. From 2004 to 2014, employment in all occupations grew 5.5 percent, averaging 0.5 percent per year. Over the same period, the top 15 H-2B occupations had widely varying rates of employment growth. Six experienced employment declines; seven experienced growth that was positive and above the 5.5 percent growth rate for all occupations; and two experienced growth that was lower than the percentage change for all occupations. Amusement and Recreation Attendants, Coaches and Scouts, Waiters and Waitresses, Nonfarm Animal Caretakers, and Cooks, Restaurant, all grew by more than 10 percent from 2004 to 2014. Three occupations experienced employment growth far exceeding the overall growth of 5.5 percent for all occupations from 2004 to 2014: Nonfarm Animal Caretakers (99.5 percent), Coaches and Scouts (72.3 percent), and Cooks, Restaurant (44.3 percent). The three occupations with employment declines from 2004 to 2014 were Fishers and Related Fishing Workers (-57.4 percent); Forest and Conservation Workers (-24.8 percent), and Packers and Packagers, Hand (-20.5 percent). The top H-2B occupation in FY 2014, Landscaping and Groundskeeping Workers, grew by only 1.0 percent from 2004 to 2014 (an average of 0.1 percent per year). Unemployment rates in H-2B occupations are calculated from Current Population Survey basic monthly microdata, which are jointly maintained by the U.S. Census and the Bureau of Labor Statistics. These data are not classified by SOC code, but instead use Census codes. However, the H-2B occupations with the 15 largest numbers of certifications in fiscal 2014 match up reasonably well with the same or similar occupations found in the CPS data using the government’s crosswalks between the occupations, even though the occupational titles may differ slightly in some cases. Figure A shows the average unemployment rates in each of the occupations listed, for 2004–2005, 2006–­2007, and 2013–­2014. Two years of data were pooled together to increase sample sizes. The first two periods listed were chosen because they exclude the years of the recession that began in 2008 and its aftermath, and 2013–2014 was chosen because those years represented the most recent data available. Figure A shows that the unemployment rate rose in all but one of the top 15 H-2B occupations between 2004 and 2014. The average unemployment rate of Helpers-Production Workers was 10.8 percent during 2004–2005 and ended up at 10.3 percent during 2013–2014. Although the unemployment rate in this occupation has declined since 2004, it has declined by only one-half of a percent, and remained very high in 2014. The average annual unemployment rate for all workers in the United States in 2014 was 6.2 percent. During 2013–2014, none of the 15 H-2B occupations was at or below the overall U.S. unemployment rate for 2014. Three occupations—Nonfarm Animal Caretakers; Athletes, Coaches, Umpires, and Related Workers; and Butchers and Other Meat, Poultry, and Fish Processing Workers, had an unemployment rate that was roughly about one percentage point higher than the national unemployment rate, while the other 12 occupations had much higher unemployment rates. Nine of the occupations had unemployment rates 10 percent or higher in 2013–2014, with the highest being Construction Laborers at 14.7 percent. Grounds Maintenance Workers, which corresponds to Landscaping and Groundskeeping Workers (SOC code 37-3011), the top H-2B occupation by far, had an average unemployment rate of 12.7 percent during 2013–2014, more than double the national unemployment rate. The following is an assessment of the evidence presented on wages, employment, and unemployment rates in H-2B occupations, using the the definition offered by Martin and Ruhs on how to determine a labor shortage. (1) Are real wages in top 15 H-2B occupations rising relative to other occupations? Real wages are rising in only three of the top 15 H-2B occupations, and this rise is not significant. According to OES data, wages across all occupations stagnated in the United States between 2004 and 2014, rising only $0.40 in real terms (2014 dollars), 1.8 percent for all occupations. And as Table 2 shows, the story was mostly similar or worse in the top 15 H-2B occupations, where wages declined in real terms in 10 of the top 15 occupations. While wages increased in real terms in five of the top 15 occupations, the increases were insignificant: less than $1 in all cases, and less than a nickel in two of the occupations. In three occupations (Waiters and Waitresses, Fishers and Related Fishing Workers, and Dining Room and Cafeteria Attendants and Bartender Helpers) wages did rise faster than they did for all occupations, but rose at far less than even 1 percent per year. (2) Is there faster-than-average employment growth in top 15 H-2B occupations? There is faster-than-average employment growth in less than half of the occupations. As Table 3 shows, from 2004 to 2014, seven of the top 15 occupations experienced employment growth that exceeded the 5.5 percent increase for all occupations, six experienced declines, and two experienced growth lower than the rate for all occupations. Three occupations experienced employment growth far exceeding the overall growth of 5.5 percent for all occupations from 2004 to 2014: Nonfarm Animal Caretakers (99.5 percent), Coaches and Scouts (72.3 percent), and Cooks, Restaurant (44.3 percent); however, wages in these three fastest-growing occupations declined over the same 10-year period. (3) Do the top H-2B occupations have relatively low and declining unemployment rates? Rather than declining, unemployment rates increased in all but one of the top 15 H-2B occupations between 2004–2005 and 2013–2014, and all averaged very high unemployment rates in 2013–2014. The unemployment rate declined in one occupation, Helpers-Production Workers, which had an average unemployment rate of 10.8 percent during 2004–2005 and 10.3 percent during 2013–2014. Although the unemployment rate in this occupation declined by half a percentage point between 2004–2005 and 2013–2014, the unemployment rate remained very high in 2013–2014. In 11 of the top 15 H-2B occupations, the unemployment rate dropped from 2004–2005 to 2006–2007, but then rose significantly between 2006–2007 and 2013–2014. Such high unemployment rates suggest a loose labor market—an oversupply of workers rather than an undersupply—in the top 15 H-2B occupations. While seven of the top 15 occupations experienced employment growth that exceeded the 5.5 percent increase for all occupations, the fact that wages were stagnant or declined, combined with persistently high unemployment rates, makes it highly unlikely that labor shortages exist at the national level in any of the top H-2B occupations. This does not mean that no labor shortages exist anywhere in the United States in these occupations—it is entirely possible and even likely that shortages exist in some states or localities—but the high national unemployment rates in H-2B occupations suggest that even the employers experiencing a local labor shortage might find available U.S. workers if they recruited outside their city, region, or state, and if they offered more attractive wages and benefits (including transportation and housing). If the available evidence suggests that there are no national-level labor shortages in H-2B occupations, then why, it must be asked, do employers value the H-2B program so much? There are two main reasons: First, because of the nature of the H-2B program, H-2B workers are tied to a single employer, which makes them unlikely to leave their seasonal job in the middle of a season. But this leaves H-2B workers vulnerable to abuse and exploitation. Second, H-2B employers like the H-2B program because they are legally permitted to pay H-2B workers less than similarly situated U.S. workers. There are countless examples of H-2B migrant workers being exploited and robbed of their wages, and much worse. That’s why civil rights groups have referred to the H-2B program as “close to slavery.”12 A recent journalistic investigation dubbed it “the new American slavery.”13 The problems begin when H-2B workers are first recruited in their home countries.14 Most pay large sums to labor recruiters who connect them to temporary jobs in the United States.15 That leaves the workers who come to the United States indebted to their recruiters and employers. H-2B workers also cannot switch employers, which means that if something goes wrong on the job—for instance, if an H-2B worker isn’t paid the wage he or she was promised, or is forced to work in an unsafe workplace—the H-2B worker has little incentive to speak up or complain to the authorities. Complaining can result in getting fired, which leads to becoming undocumented and possibly deported. It also means not being able to earn back the money that was invested in order to get the job. It is not an exaggeration to say that H-2B workers are indentured workers. Note: All values in 2014 dollars. Other evidence suggests just how low wages really are for H-2B workers. Research published by the Economic Policy Institute shows that incredibly, migrant workers in the H-2B and H-2A visa programs on average earn approximately the same wages as undocumented workers.26 That means H-2B guestworkers earn no wage premium for having a “legal” immigration status. Instead, they earn as little as undocumented workers who have few labor and employment rights. As the data revealed in the CATA v. Perez decision and reported by Bloomberg show, a significant number of employers began to request that DOL approve their submitted private wage surveys—by an increase of 3,182 percent soon after promulgation of the 2013 IFR—and in 21.1 percent of those determinations, the certified wage was lower than even the Level 1, 17th percentile wage for the position (by occupation and local area), and 94.4 percent of the determinations were for a wage that was lower than the Level 2, 34th percentile wage. This is clear evidence that the shift to the use of private wage surveys was a systematic response by H-2B employers to keep H-2B wages lower than the local average OES wage rate that would otherwise be required under the 2013 IFR. American workers are also hurt because when H-2B workers have few rights and employers are allowed to legally underpay them, it puts downward pressure on the wages and working conditions of American workers who are employed or seeking work in the main H-2B occupations. The low wages H-2B workers are paid, combined with the indentured nature of their relationship to their employers, is also why employers prefer to hire H-2B workers instead of American workers. American workers who have access to basic labor standards and the social safety net, and who can accept a job offer from an employer across town who offers a higher wage, are less appealing than workers who can’t complain, look for another job, or demand a higher wage. The H-2B program therefore undercuts the incentive that employers in a free market should have have to hire American workers or to make jobs more appealing to American workers by improving wages and working conditions. *Hourly wage rate was unavailable for this occupation in the OES data so an hourly wage rate was estimated by dividing the average annual salary by 2080 hours (52 weeks*40 hours). Note: All values adjusted to 2015 dollars. Source: Office of Foreign Labor Certification Performance Data, H-2B Disclosure Data, Employment and Training Administration, U.S. Department of Labor, http://www.foreignlaborcert.doleta.gov/performancedata.cfm; EPI analysis of Occupational Employment Statistics survey data, Bureau of Labor Statistics, U.S. Department of Labor. As Figure B shows, unemployment remained high in almost all of the top 15 H-2B occupations during the 2014-2015 period. The top occupation of Landscaping and Groundskeeping Workers had an unemployment rate of 11 percent in 2014–2015—more than double the national unemployment rate in 2015. Seven of the occupations were at or above double digits. Only three of the top 15 H-2B occupations had an unemployment rate lower than 7 percent: Butchers and other meat, poultry, and fish processing workers;36 Nonfarm animal caretakers; and Athletes, coaches, umpires, and related workers. *Relates to two H-2B occupation categories in the top 15: "Meat, Poultry, and Fish Cutters and Trimmers" and "Cutters and Trimmers, Hand"
Such high unemployment rates combined with flat or declining wage growth suggest—rather than labor shortages in H-2B occupations—that there instead exists a continuing loose labor market in 2015 for the top 15 H-2B occupations. With this backdrop, I will turn briefly to the April 2015 H-2B regulations promulgated by the Obama administration. (B) The job opportunity is within an occupational classification of the SOC system designated as an “all other” classification. If the survey falls into one of these categories, then additional methodological requirements for the survey are listed in the remaining subsections of 20 C.F.R. 655.10(f). This narrowed employers’ ability to use private wage surveys as compared to the 2013 IFR and 2008 Bush wage rule. The 2015 wage rule has some obvious flaws, however, which could lead to results similar to past years when H-2B wages were mostly certified at below-average wages. The 2015 rule continues to allow paying H-2B workers an hourly wage rate that is lower than the local OES average if a CBA applies, and the 2015 rule still permits the use of non-OES wage surveys. While 20 C.F.R. 655.10(f) restricts which non-OES surveys may be used to establish an H-2B prevailing wage, still permitted are surveys “conducted and issued by a state, including any state agency, state college, or state university.” Employers and employer groups might respond by requesting that state agencies and/or universities conduct new wage surveys in certain regions and occupations, and may even fund such surveys—and therefore perhaps exert undue influence on the results—since nothing in the H-2B regulations prohibits requesting that a wage survey be conducted by a public agency or a university and then privately funding it. Nevertheless, the 2015 wage rule held the possibility of improving H-2B wage rates by restricting the use of private wage surveys. Some data are now available to measure the impact of the 2015 H-2B wage rule. Table 6 shows for fiscal 2015 the national average certified H-2B wage for the top 15 H-2B occupations, the average OES wage, and how much employers saved in fiscal 2015, on average, by hiring an H-2B worker instead of an American worker earning the average wage. What Table 6 shows is that H-2B employers still saw significant wage savings by hiring H-2B workers instead of Americans or other qualified U.S. workers earning the average wage, but in the top H-2B occupation, Landscaping and Groundskeeping Workers, the wage savings were lower than they had been in at least the past three years. Employer wage savings were more than 50 percent lower than the year before (from $2.59 to $1.25). Although the 2015 wage rule was only in place for half of the fiscal year, these data are preliminary evidence that the H-2B wage rule was beginning to have its intended impact of raising H-2B wage rates closer to the the average wage by restricting the use of private wage surveys. If H-2B employers began to see wage rates increase as a result of the 2015 wage rule, it is reasonable to conclude that fact is what led to the lobbying effort to amend the 2015 wage rule and lower H-2B wage rates through the appropriations legislation. This section will discuss the substance and possible impacts of the main provisions from the fiscal 2016 appropriations riders that became law in late 2015. It is important to note that on April 29, 2015, the same day the 2015 wage rule was published and took effect, the Obama DHS and DOL also published an Interim Final Rule that revamped the rules governing the H-2B program (the 2015 IFR).38 The 2015 IFR was a hailed by workers’ rights groups as an important step forward for improving the program and for protecting the rights of both migrant and American workers. After the 2015 IFR had been in force for just a few months, a set of legislative riders were included in the Consolidated Appropriations Act of 201639 (an omnibus bill to fund the government during fiscal 2016), which made a number of changes to the H-2B program, and the bill was eventually signed into law in December 2015. Some of the appropriations riders were targeted at the new worker protections extended to migrant and American workers by the 2015 IFR. The determination of prevailing wage for the purposes of the H-2B program shall be the greater of—(1) the actual wage level paid by the employer to other employees with similar experience and qualifications for such position in the same location; or (2) the prevailing wage level for the occupational classification of the position in the geographic area in which the H-2B nonimmigrant will be employed, based on the best information available at the time of filing the petition. In the determination of prevailing wage for the purposes of the H-2B program, the Secretary [of Labor] shall accept private wage surveys even in instances where Occupational Employment Statistics survey data are available unless the Secretary determines that the methodology and data in the provided survey are not statistically supported40 [emphasis added]. As a result, employers will likely be permitted to use private wage surveys in a much broader range of circumstances, and this may result in H-2B workers being paid wages that are below the OES local average wage for their jobs. So far DOL has only given a preliminary indication of how it will interpret, implement, and enforce some of the December 2015 amendments to the H-2B program in the Consolidated Appropriations Act of 2016.41 DOL has not, however, explained in detail how it will implement the provisions relating to private wage surveys. DOL has also not yet indicated whether it will publish new regulations to implement these changes, either as an interim final rule or as a regulation that is subject to notice and comment procedures under the Administrative Procedure Act. Impact: It is likely that many fiscal 2016 H-2B prevailing wage determination applications had already been submitted before the appropriation rider authorization to broaden the use of employer wage surveys had become law. As a result, it is likely that the survey rider may not have a large impact on 2016 H-2B wage rates. However, since February 2016 the DOL has been increasingly accepting employer-provided wage surveys. It follows that if employers anticipate as of the beginning of fiscal 2017 that appropriations language will permit the submission and acceptance of employer-provided wage surveys in lieu of the Bureau of Labor Statistics (BLS) Occupational Employment Statistics (OES) wage survey data, then the ability of private wage surveys to push down average H-2B wage rates to below-average wage rates will be very significant. Impact: At present, neither DOL nor the State Department have published the number of H-2B returning workers who have been issued visas for fiscal 2016. There exists the possibility that the returning worker exemption from the 66,000 annual numerical limit which was approved in December 2015 for fiscal 2016 has not and will not result in a large increase in the number of H-2B workers in fiscal 2016. If this were to occur, the likely reason would be that H-2B employers did not have time to prepare to take advantage of the exemption by finding and attempting to hire migrant workers who were employed as H-2B workers in the past three fiscal years. A large increase in the number of H-2B workers is likely to occur if the returning worker exemption is extended for the entire 2017 fiscal year and beyond. If H-2B employers are able to anticipate and plan for an exemption from the annual numerical limit when submitting their applications for H-2B labor certification in fiscal 2017, then it is reasonable to conclude that the number of H-2B workers will increase far above the cap, as it did in fiscal 2005–2007. Impact: Under the appropriations rider language, DOL may not use funds appropriated in fiscal 2016 to enforce the rule on corresponding employment. The rule still exists on paper, but DOL may not enforce it, which in practice means that employers will not be sanctioned for violating the corresponding employment rule. That means that employers will be able to offer higher wages and additional benefits to H-2B workers without being required to offer them to American workers. While it may seem counterintuitive that an H-2B employer would offer higher wages and/or better benefits to a migrant employee, this may occur in order for the employer to discourage the American worker from remaining on the job. It is interesting to note that no senator or representative has publicly articulated the basis for denying U.S. workers the same wage rates and benefits earned by H-2B workers in the appropriations legislation. Substance: Under the 2015 IFR, H-2B employers must “offer [H-2B] workers full-time employment for a total number of work hours equal to at least three-fourths of the workdays of each 12-week period (or 6-week period if the employment covered by the job order is less than 120 days),” with a workweek calculated as lasting 35 hours.44 In simpler terms, each employer must now guarantee each worker a total number of paid work hours equal to at least three-fourths of the workdays in the job order. This rule helps protect H-2B workers from coming to the United States for a temporary job opportunity, only to find that there are not enough work hours available to him or her. Impact: Again, under the appropriations rider language, DOL may not use funds appropriated in fiscal 2016 to enforce the three-fourths guarantee. The rule still exists on paper, but DOL may not enforce it, which in practice means that employers will not be sanctioned for failing to offer H-2B workers a minimum number of work hours. H-2B workers are greatly harmed when they do not have enough work hours to earn enough to live, save, and pay back the debts incurred to labor recruiters in order to obtain their job. Substance: The Consolidated Appropriations Act of 2016 also prevents DOL from using funds to audit H-2B applications or to conduct audits or assisted or supervised recruitment under 20 CFR § 655.70 and 20 CFR § 655.71. Under 20 CFR § 655.70 DOL has the discretion and authority to audit H-2B labor certifications submitted by employers—the key part of which is the recruitment of U.S. workers to determine if any U.S. workers are available and willing to be employed for the employer’s job opening—before an employer may hire an H-2B worker for the job. If the situation is warranted, under 20 CFR § 655.71, DOL may require the audited employer to conduct recruitment activities under the supervision of DOL. If the employer refuses to comply with the audit or the supervised recruitment, the employer can be debarred from using the H-2B program. 20 CFR § 655.70 and 20 CFR § 655.71 are important rules that guard the integrity of the statutory requirement that H-2B employers first recruit American workers before hiring an H-2B worker. Impact: Many migrant and worker advocates have been consistently disappointed with DOL’s failure to enforce regulations and requirements of the H-2B program. Many of the deficiencies in enforcement were laid bare in “The Pushovers,”45 an investigative news report about DOL enforcement in the H-2B and H-2A programs. Nevertheless, when DOL finds that U.S. workers have not been given an adequate opportunity to apply for and get hired for certain job vacancies, assisted and supervised recruitment provides a legitimate means for addressing this. Audits have allowed DOL to probe issues such as the failure of H-2B employers to hire U.S. workers, and when H-2B employers seek to exclude U.S. workers from job opportunities in favor of H-2B workers. Stripping DOL’s ability to audit the recruitment efforts of employers, or to require employers to recruit when they have failed to do so, and finally, to debar employers who fail to first recruit American workers before they hire an H-2B guestworker, severely hampers DOL’s enforcement efforts. But perhaps more importantly, this particular H-2B appropriations rider strikes at the heart of the integrity of the H-2B program. If DOL cannot audit employers to enforce the basic premise of the H-2B program—that H-2B workers should not be hired unless there are no U.S. workers available—then employers may simply bypass the U.S. workforce for any and all H-2B job openings. Most of the December 2015 amendments to the H-2B program, including the amendment to the 2015 wage rule, will remain in place for all of fiscal 2016. If no further amendments are made through standalone legislation or appropriations legislation to fund the U.S. government in fiscal 2017, the original 2015 wage rule (as promulgated in April 2015) and the 2015 IFR would become effective again at the beginning of fiscal 2017, and the returning worker exemption and the restrictions on using appropriated funds to enforce the H-2B rules listed above would expire. It is my hope that this testimony will shed some light on the data and evidence that exists regarding how the H-2B program is being used. While the voices of employers and powerful lobby groups pushing for expansion and deregulation of the H-2B program have gotten a fair amount of attention, low-wage-earning migrant workers and overlooked U.S. workers have not been heard from nearly as much. It is obvious to me that the H-2B program is harming both American workers and many of the migrant workers who come to work as landscapers and construction workers, as well as in other major H-2B jobs. But I urge the Subcommittee to see the problem with the H-2B program for what it really is. This is not a case of migrants coming to the United States to “steal” low-wage jobs from Americans, and migrant workers cannot be blamed for keeping wages low in H-2B jobs. But the low and stagnant wages in H-2B occupations are also not the result of benign, abstract economic forces. They reflect conscious policy choices by lawmakers influenced by powerful corporate lobby groups who have used their influence to water down the protections that migrant and American workers should enjoy as a matter of course. In other words, migrant guestworkers are not the ones keeping wages down and conditions deplorable in lower-skilled H-2B occupations; it’s their employers. H-2B employers can and should be held to a higher standard, but Congress has to decide to require it of them. The following are a few of the most important recommendations to improve the H-2B program. I am happy to provide additional recommendations at the Subcommittee’s request, but the following are the most important in the context of today’s hearing. The local 75th percentile wage for the occupation under the most recent Bureau of Labor Statistics Occupational Employment Statistics survey. In addition, H-2B rules should specify that minimum pay offered to U.S. workers and H-2B workers never be lower than 150 percent of the U.S. federal minimum wage, regardless of any other applicable prevailing wage. At present, some H-2B jobs are certified at wages at or near the federal minimum wage, and in the past, some have been certified at wages below the federal minimum wage.47 Employers should not have the ability to recruit workers from abroad for U.S. jobs, only to pay them a wage as low as the federal minimum wage, which is a poverty-level wage. Immigration policy is of vital importance to the United States, both from an economic and security perspective. The American public deserves an open and transparent debate in Congress about the costs and benefits, impacts on stakeholders, and trade-offs inherent when making decisions about how the United States government will manage its immigration system. Making policy changes through appropriations legislation usurps the regular legislative process and has allowed lawmakers to make major changes to the H-2B program without having to be accountable for their actions, since most members of Congress do not have to take a separate vote on the provisions impacting the H-2B program. It is highly likely that the changes made to the H-2B program in the fiscal 2016 appropriations riders—lowering wages through private wage surveys, increasing the number of H-2B workers through the returning worker exemption, and stripping DOL of enforcement authority—would not pass as a stand-alone bill. The lawmakers who agreed with and furthered the positions advocated for by H-2B employers and their lobbyists managed to avoid an on-the-record vote in Congress on the H-2B program in 2016, and as a result, also managed to avoid major public scrutiny. Congress should not allow this to happen again in 2017. 1. Seung Min Kim, “New Immigration Fight Looms in Congress,” Politico (May 5, 2016), http://www.politico.com/story/2016/05/h2b-riders-222737. 2. Daniel Costa, The H-2B Temporary Foreign Worker Program: For Labor Shortages or Cheap, Temporary Labor? Economic Policy Institute report (January 19, 2016), http://www.epi.org/publication/h2b-temporary-foreign-worker-program-for-labor-shortages-or-cheap-temporary-labor/. 4. U.S. Department of State, Nonimmigrant Visa Statistics, “Table XVI(B): Nonimmigrant Visas Issued by Classification (Including Border Crossing Cards), Fiscal Years 2011-2015” (2016), https://travel.state.gov/content/dam/visas/Statistics/AnnualReports/FY2015AnnualReport/FY15AnnualReport-TableXVIB.pdf. 6. Andorra Bruno, The H-2B Visa and the Statutory Cap: In Brief, Congressional Research Service (December 11, 2015), http://www.hsdl.org/?view&did=789236. 7. Seung Min Kim, “New Immigration Fight Looms in Congress,” Politico (May 5, 2016). 8. Immigration and Nationality Act, § 101(a)(15)(H)(ii)(b) [8 U.S.C. §1101(a)(15)(H)(ii)(b)]. 9. Essential Worker Immigration Coalition, Website home page (accessed December, 2015), http://ewic.org. 10. Martin, Philip, and Martin Ruhs, Labor Shortages and U.S. Immigration Reform: Promises and Perils of an Independent Commission, International Migration Review, Volume 45, Issue 1 pages 174–187, (Spring 2011), http://onlinelibrary.wiley.com/doi/10.1111/j.1747-7379.2010.00843.x/abstract. 11. It must be noted that the labor market data metrics used for determining whether a labor shortage exists can also be usefully supplemented with additional evidence. For example, when assessing whether a labor shortage exists, the United Kingdom’s Migration Advisory Committee (MAC) also interviews employers, workers, labor unions, and other stakeholders to get a more complete picture than can be gathered purely from national-level labor market statistics. (The MAC refers to these surveys as “bottom-up” evidence.) These qualitative data can be useful and round out the analysis when labor market data do not provide a clear-enough picture on their own. Nevertheless, if unemployment rates in an occupation are exceptionally high and wages do not rise for a prolonged period of time, those two factors are strong evidence that a labor shortage does not exist. 12. Southern Poverty Law Center, Close to Slavery: Guestworker Programs in the United States (February 18, 2013), https://www.splcenter.org/20130218/close-slavery-guestworker-programs-united-states. 13. Jessica Garrison, Ken Bensinger, and Jeremy Singer-Vine, “The New American Slavery: Invited to the U.S., Foreign Workers Find A Nightmare,” BuzzFeed News (July 24, 2015), https://www.buzzfeed.com/jessicagarrison/the-new-american-slavery-invited-to-the-us-foreign-workers-f?utm_term=.gfyk4WAbgJ#.lyREpxV9Kq. 14. Megan Twohey, Mica Rosenberg, and Ryan McNeill, “Wanted: Foreign Workers — And the Labor Brokers Accused of Illegally Profiting from Them,” Reuters (February 19, 2016), http://www.reuters.com/investigates/special-report/workers-brokers/. 15. Ken Bensinger, Jessica Garrison, and Jeremy Singer-Vine, “The Coyote,” BuzzFeed News (December 29, 2015), https://www.buzzfeed.com/kenbensinger/the-coyote?utm_term=.le095BJnl7#.tew5Aadeo1. 16. Rachel Luban, “Jury Awards Guestworkers Over $14 Million in Landmark Human Trafficking, Forced Labor Case,” In These Times (February 19, 2015), http://inthesetimes.com/working/entry/17657/guestworkers_new_orleans. 17. New York Times editorial board, “Forced Labor on American Shores” (July 8, 2012), http://www.nytimes.com/2012/07/09/opinion/forced-labor-on-american-shores.html. 18. Ken Bensinger, Jessica Garrison, and Jeremy Singer-Vine, “The Pushovers,” BuzzFeed News (May 12, 2016), https://www.buzzfeed.com/kenbensinger/the-pushovers?utm_term=.fw9jmY6wV5#.sejm2WQN76. 19. United States Government Accountability Office (GAO), H-2A and H-2B Visa Programs: Increased Protections Needed for Foreign Workers (March 2015), http://www.gao.gov/assets/670/668875.pdf. 20. Laura Francis, “DOL’s Use of Private Wage Surveys In H-2B Program Struck Down by 3rd Cir,” Bloomberg BNA (December 8, 2014), http://www.bna.com/dols-private-wage-n17179918115/. 21. Barry Meier, “Union Accused of Betraying Migrant Carnival Workers,” New York Times (September 1, 2015), http://www.nytimes.com/2015/09/02/business/union-accused-of-betraying-migrant-carnival-workers.html. 22. Daniel Costa, The H-2B Temporary Foreign Worker Program: For Labor Shortages or Cheap, Temporary Labor? Economic Policy Institute report (January 19, 2016), http://www.epi.org/publication/h2b-temporary-foreign-worker-program-for-labor-shortages-or-cheap-temporary-labor/. 26. Lauren Apgar, Authorized Status, Limited Returns: The Labor Market Outcomes of Temporary Mexican Workers, Economic Policy Institute report (May 21, 2015), http://www.epi.org/publication/authorized-status-limited-returns-labor-market-outcomes-temporary-mexican-workers/. 27. U.S. Department of Homeland Security and U.S. Department of Labor, Wage Methodology for the Temporary Non-Agricultural Employment H–2B Program, Part 2, RIN 1205–AB69, 78 Fed. Reg. 24047 (April 24, 2013), http://www.aila.org/infonet/dol-78-fr-24047-04-24-13. 29. Comité de Apoyo a Los Trabajadores Agricolas (CATA) v. Perez, No. 14-3557, Doc. No. 003111811504 (3d Cir. Dec. 5, 2015), at 15, http://www.bloomberglaw.com/public/desktop/document/Comite_de_Apoyo_a_los_Trabajad_et_al_v_Thomas_E_Perez_et_al_Docke?1465282119. 31. Laura Francis, “DOL’s Use of Private Wage Surveys In H-2B Program Struck Down by 3rd Cir,” Bloomberg BNA (December 8, 2014), http://www.bna.com/dols-private-wage-n17179918115/. 32. Comité de Apoyo a Los Trabajadores Agricolas (CATA) v. Perez, No. 14-3557, Doc. No. 003111811504 (3d Cir. Dec. 5, 2015), at 26–27 (footnotes omitted). 33. Immigration and Nationality Act, § 101(a)(15)(H)(ii)(b) [8 U.S.C. §1101(a)(15)(H)(ii)(b)]. 34. Jessica Garrison, Ken Bensinger, and Jeremy Singer-Vine, “All You Americans Are Fired,” BuzzFeed News, December 1, 2015. 35. Daniel Costa, The H-2B Temporary Foreign Worker Program: For Labor Shortages or Cheap, Temporary Labor? Economic Policy Institute report (January 19, 2016), http://www.epi.org/publication/h2b-temporary-foreign-worker-program-for-labor-shortages-or-cheap-temporary-labor/. 37. U.S. Department of Homeland Security and U.S. Department of Labor, Wage Methodology for the Temporary Non-Agricultural Employment H–2B Program, Docket No. ETA–2013–0003], RIN 1205–AB69. 80 Fed. Reg. 24146 (April 29, 2015), http://www.gpo.gov/fdsys/pkg/FR-2015-04-29/pdf/2015-09692.pdf. 38. See e.g., Wage and Hour Division, U.S. Department of Labor, “WHD H-2B Side-by-Side Comparison of the 2009 and 2015 Rules,” available at https://www.dol.gov/whd/immigration/h2bfinalrule/h2bsidebyside.htm. 39. Consolidated Appropriations Act of 2016, H.R. 2029, 114th Cong., § 112 (2015). Pub. L. No. 114-113. 42. Andorra Bruno, The H-2B Visa and the Statutory Cap: In Brief, Congressional Research Service (December 11, 2015), http://www.hsdl.org/?view&did=789236. 43. See e.g., Wage and Hour Division, U.S. Department of Labor, “Fact Sheet #78A: Corresponding Employment under the H-2B Program,” available at https://www.dol.gov/whd/regs/compliance/whdfs78a.pdf. 44. See e.g., Wage and Hour Division, U.S. Department of Labor, “Fact Sheet #78E: Job Hours and the Three-Fourths Guarantee under the H-2B Program,” available at https://www.dol.gov/whd/regs/compliance/whdfs78e.pdf. 45. Ken Bensinger, Jessica Garrison, and Jeremy Singer-Vine, “The Pushovers,” BuzzFeed News (May 12, 2016), https://www.buzzfeed.com/kenbensinger/the-pushovers?utm_term=.fw9jmY6wV5#.sejm2WQN76. 46. For more about the DOL/BLS OES survey, see Bureau of Labor Statistics, U.S. Department of Labor, Occupational Employment Statistics, “Frequently Asked Questions,” available at http://www.bls.gov/oes/oes_ques.htm. 47. See, “Learning From the Past: Designing Effective Worker Protections for Comprehensive Immigration Reform,” 16 Temp. Pol. & Civ. Rts. L. Rev. 423 (Spring 2007).